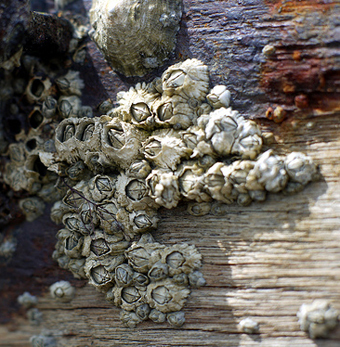 If you’ve been anywhere near the ocean, you’ve likely seen barnacles – the hard-shelled crustaceans that crust over wharves and rocks and the hulls of boats by the hundreds. Once they attach themselves to a solid surface, they are there forever, resting when the tide is out, feeding on plankton when the tide is in. 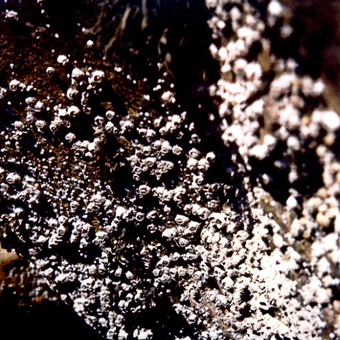 Barnacles contribute to a phenomenon called biological fouling, which is essentially the accumulation of organisms on submerged surfaces. When this happens on a rock, there is no negative impact. When it happens to a wharf, the wood eventually decays. When it happens to a ship, it increases drag, which in turn increases fuel use, making the ship less efficient. Biological fouling also made a gruesome form of punishment, called keelhauling, available to the Dutch Navy until it was outlawed in 1853. The offending sailor finds himself tied to a line that loops under the ship. Once secured, the crew throws him overboard and drags him under the ship’s keel – the length of the ship from bow to stern. If the crew pulls the line quickly, the sharp shells of the barnacles on the hull tear the sailor’s body to ribbons. If they pull the line slowly, the sailor misses the barnacles, but the extra time underwater likely causes him to drown. Of the two alternatives, the latter was considered a mercy. You may have noticed that we’ve given Unwinnable a bit of a facelift. Along with the aesthetic upgrades, I decided to take the opportunity to remove comments from the site. I want to talk a little bit about how I came to that decision. Unwinnable’s first post was published on June 3, 2010. Since then, we’ve had the relatively small number of 3,781 comments posted. Most of these have ranged from brief and positive at worst to deeply thoughtful at best. Unwinnable has always tended to be a place of quiet contemplation. Sometimes, commenters have left me in awe. When I wrote Death and Gaming, the essay that detailed my father’s illness and death, the outpouring of support that flooded the comments overwhelmed me. It was one of those rare moments the Internet seemed full of human decency. Other contributors to Unwinnable – Jenn Frank, Cara Ellison, Peter Rubin, to name a few – have witnessed similar floods. It is tempting, then, to lay all the blame on the occasional bad eggs who turn up to spew their idiocy. They are the sharp-shelled barnacles that bloody the waters we’re all swimming in, but they are just a symptom of the real problem. All comments, good and bad, are the problem. A ship is built to sail, not to be a home for barnacles. Most of the stories that I publish begin as a pitch from a writer. Sometimes, I will talk to a writer and ask them to write something specific. The method varies from writer to writer, from story to story. Sometimes I am very hands-off; sometimes I roll up my sleeves and tear a piece apart to make it better. Sometimes a story gets passed around multiple writers and editors on the team. Whatever the process, the goal is always the same – to communicate an idea. Whether that idea illuminates, educates, angers or entertains is beside the point. In fact, whether an audience reads it or not is also beside the point. Inviting discussion on Unwinnable diminishes the writer’s intention. It invites the world into the editorial process. Comments, good and bad, are a crust that increases our drag. They are a distraction to every reader who comes after. On Unwinnable, the page is for the writer and the writer alone. Discussion is not a bad thing. Unwinnable is just not the place to have it. We’re all on Twitter and Facebook – we can chat there, civilly, thoughtfully, like friends at a bar discussing the books they’ve been reading. But on Unwinnable, the last word of a story will always be one written by its author. Most writers on Unwinnable provide their Twitter handle at the end of their stories. It would make their day if you tweeted your compliments to them directly. If you have a strong opinion about one of our articles, I invite you to write a letter to the editor – please include a link to the original article. Letters will be published as scheduling allows, and all will be given the same editorial care as any other Unwinnable article.